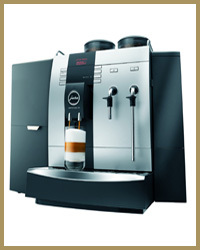 The Jura Impressa X9 is a table top bean to cup coffee machine using fresh milk. It is suitable for low to medium usage sites (up to 120 coffees per day). It is equally at home in an office environment, behind a bar or in a hotel conferencing suit and can produce up to 20 coffee specialities. 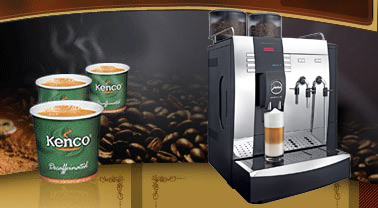 The machine is easy to use as it simply requires the touch of one button to produce a cappuccino, latte or espresso. The spout is adjustable in height and as such can accommodate a variety of different sized cups and glasses. As with the rest of the range the cleaning and de-scaling cycles are run with simply the touch of a button. The water tank can be manually filled, in which case it uses an in tank Claris filter in order to maintain drink quality, or it can be adapted to use the Jura plumbing kit, converting the machine into a plumbed in system. This is often ideal as it means that you do not have to keep filling the water tank up by hand and allows us to fit a larger commercial water filter that needs changing less often than the smaller in tank systems. There are also milk flasks and cup warmers available to complete the offering. 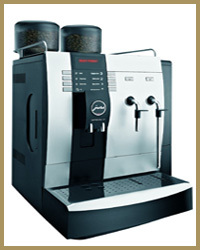 We recommend the Impressa X9 for sites consuming up to 120 coffees a day. If you are looking to produce more drinks through one of our fresh milk bean to cup systems then the Jura GIGA range would potentially be more suitable. It is also worth bearing in mind that whilst there is a hot water button on the machine it should not be treated as a hot water boiler. If you do require large quantities of hot water a hot water boiler alongside your coffee machine is a better idea. These machines are available on rental, lease and purchase deals. 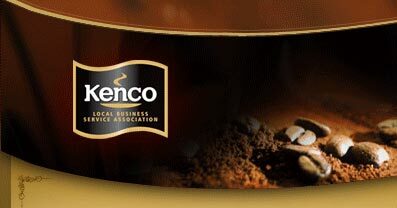 Indeed Kenco Local Business Service often have refurbished equipment available that we can offer on much more flexible terms. If you are based in London and are looking for this type of equipment please give us a call.